Check our journey till the interview here. We originally had our interview date for 8th April. But after checking on the ustraveldocs religiously, we were able to get an interview date for 25th March at Consulate General Mumbai. We completed our medical at Max Delhi on 9th March and biometrics at OFC center of VFS Global at Shivaji Stadium Metro Station in Delhi. Before leaving for Mumbai we got the DD made for the visa fees which was $325 converted into INR 24050 (according to ustraveldocs valid exchange rate) payable at Mumbai and drawn in favor of "US Consulate General, Mumbai". This is applicable if you are filing DCF and have skipped the NVC stage and have not paid the fee online. We arrived in Mumbai on the 24th. There are a couple of good hotel options for people coming from other cities that are very nearby to the consulate. We chose the Trident Hotel, as it is the closest one and you can walk 2 minutes and reach the consulate. The consulate does not allow any kind of phones or electronics inside. Even a smart or digital watch. So leave everything at your hotel room or with someone. They don't even allow the Xray CD you will get after your medical, so no need to bring that. Our appointment was at 7:15 AM. We reached outside the consulate at 6:45 am and there were already a lot of people there on the opposite side of the road from the consulate. Once the clock hit 7, the guards from the other side of the road ushered people to form a line along the consulate wall on the sidewalk according to the interview time slot (I believe 7:15 was the first slot). There were around 50-75 people in that slot and we all slowly walked in the consulate after showing our appointment letter, DS260 confirmation page and the passport. My wife, who is a US citizen and petitioner, was also allowed inside with me. She showed her US passport for verification. Once inside, we went through a security check like you do at an airport. Then we were told to go inside the actual consulate building where the counters are and where all the interviews take place. There were around 20 counters and sufficient seating for people to wait. We were given a token (no. 24) and told to wait until our token number flashes up on the screen and tells us which counter to go to. The people working inside were very helpful and helped in arranging the documents one needs to submit. 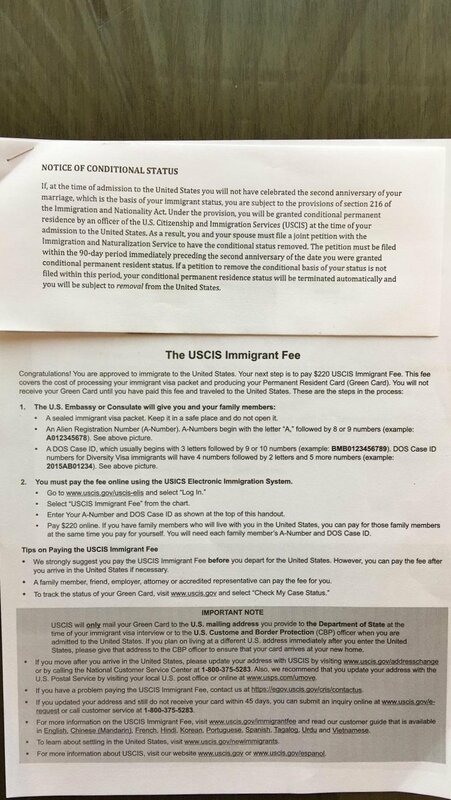 They told us to put our initial documents in order (Passport, Visa fee DD, DS 260 confirmation, Birth Certificate original & copy, Marriage certificate original & copy, PCC original, Medical report & all of the i-864 forms and transcripts). Our number was called at window 4 and an Indian officer greeted us (my wife and I both went to the window) and asked for our documents. He asked me if my wife is the petitioner and I said yes. He then got our file from the inside (which had our whole I-130 bundle that we submitted at USCIS Delhi) and added the documents we gave him to that file. He only asked us how long has my wife been living in India and nothing else. He then directed me to counter number 21 with my DD and told me to go pay the fees and bring the receipt back to him. Once that was done, he handed me the domestic violence pamphlet and directed us to sit down and wait until the CO calls us for an interview. 1 ) Who is calling you? 2 ) What is her name? 3 ) What does she do? 4 ) What are her future plans in the US? 5 ) How did you two meet? 6 ) When did you start dating? 7 ) Who proposed and when was that? 8 ) When was your wedding? 9 ) Did her parents attend the wedding? 10 ) Did your parents attend the wedding? 11 ) Who are your joint sponsors? 12 ) Where do they live in the US? 13 ) What do they do? 14 ) Do you intend to live at their address once you get to the US? 15 ) Have you been to the US before and for how long? 16 ) Have you ever stayed in the US for more than 6 months? 17 ) What was your purpose of visiting the US when you went there previously? 18 ) What is your date of birth? In total, it took us 74 DAYS from filing our I-130 to getting our visa. A big thanks to visajourney and all the good people here who replied to our questions and helped us along the way. We intend to continue being active here and help others as much as we can with our experience! Hey Congratulations but Maybe you shouldn't share this document publicly. there isn't any sensitive/private information from the docs. It's a public document handed out to all approved applicants and does not have any personal information. Okay guys!!! I got it! I apologize for my suggestion!!! Congratulations! One question I had was I've been hearing that they are planning to shut off the New Delhi USCIS Unit soon - is that true? Did you hear anything on those lines while processing for your spouse's US VISA? No there is no official word out yet about the closing of international USCIS offices. But to be better safe than sorry, if you're planning on applying for DCF, you should do it sooner rather than later. Goodluck!